Sometimes I like building up bikes more than actually riding them--fettling away for a few afternoons in the garden surrounded by tools, old bike bits, new bike bits. At the end of it all, you top it off with a couple of beers, and you've got a new bike! 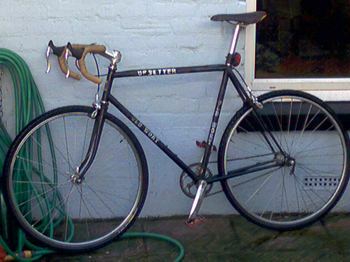 The most recent creation from my patio laboratory is a multipurpose steel steed resurrected from the remnants of several mountainbikes, contents of skips and an old, dirty and rusty Holdsworth Special road bike. I've renamed it the Old Wort Upsetter. Next up was a threaded-to-Ahead adapter, which allowed me to fit a stem with a bit of rise to the old one inch forks. And finally I fitted a 135mm MTB hub. Doing this on an old 120mm road frame means 'cold-setting': pulling apart the chain stays and cramming the wheel in. This would probably kill a modern alloy frame, but an old steel frame will cope just fine. The maiden voyage was good. It started out as a five mile road ride and turned into a 15 mile road/XC excursion. I even managed to power the 42/18 gear up the hill from Boscombe Pier. It enjoyed bombing around a golf course, despite the slick tyres. The next ride was 30 miles along the frozen Mudeford to Milford-on-Sea cliffs on the south coast of the UK. This time I used 35mm Fast Fred XC tyres. Why "Old Wort"? I cunningly applied some gaffa tape to the frame and covered up a few letters. Why "Upsetter"? Well, there's a musical Jamaican called Lee 'Scratch' Perry, who led a band called the Upsetters and also invented dub. He used lots of 'whizz, bang, ratchet, pop!' noises in his music, so many in fact that it sounds like it's about to fall apart, but somehow he kept it running smooth with a cool pace, funky flow and catchy tunes. This bike makes the same noises. It's random, and it has the cool, funky, and indeed catchy feel. The 'Upsetter' graphics were applied in white Dulux gloss, in the dark. I might get some glow-in-the-dark stuff and try again. Currently it's really an S/Ser, but it's been fixed ever since the freewheel died. Soon it'll be fixed for good. Charlie probably turned up his '81 Holdsworth catalog here. Lee Perry is an office fave, and Arkology is a perfect intro to his work. Level vibes.